Rising from the ashes of the beloved (if erratic) print digest (that itself rose from the ashes of The Scream Factory magazine), we'd like to welcome you to the bare•bones e-zine. We look forward to offering the same irreverent reviews and commentary you've come to expect from us. "Breakdown" was the seventh episode of Alfred Hitchcock Presents to air, but it was the first to be directed by Alfred Hitchcock; it was filmed from September 7th to 10th, 1955, a week before Hitchcock shot "Revenge." "Breakdown" was based on a short story of the same name that first appeared in the June 7, 1947 issue of Collier's. The story's author, Louis Pollock (1904-1964), was born in Liverpool and his family came to the United States during World War One, when Louis was 12. He became a reporter in Chicago and later moved to the West Coast, where he worked in public relations for Universal before becoming the director of advertising and publicity for United Artists. He left that job to become a screenwriter, though IMDb only shows three movies associated with him--two based on his stories and one where his work is uncredited. He also wrote for radio in the 1940s and began writing for television in 1949. He has few credits listed other than "Breakdown"; he could not sell scripts (other than "Breakdown") from 1954 to 1959 and he wondered why. In 1959 he found out that a store owner named Louis Pollack had refused to testify before the House Un-American Activities Committee and, due to a clerical error, the writer Louis Pollock had been blacklisted. His name was cleared in 1959 but he was never able to get his career going again and he died five years later. "Breakdown" was his only work for Alfred Hitchcock Presents. Pollock's story begins as businessman William Callow, who is on vacation in Miami Beach, receives a telephone call from a long-time employee who has just been fired. The man breaks down in tears and Callow is disgusted by the show of emotion. The next day, driving through rural Georgia on the way back to New York, Callow is in a terrible accident that leaves four men dead and him paralyzed. Able to see and hear but unable to speak or move, he is stripped of his clothes by two escaped convicts and left for dead. That night, looters dismantle his car. He recovers the ability to move one finger and tries to attract attention by tapping it, but when the sheriff and his men arrive, no one knows he is alive and he is loaded onto a truck and taken to the morgue along with the dead men. Spending a night in the morgue, he begins to lose hope, but a sudden welling up of emotion causes him to shed tears. The coroner notices that he is crying and he is saved. "Breakdown" is well-plotted and suspenseful, featuring a moral about a businessman who learns to value the display of emotion after undergoing a harrowing experience. The title may refer to the breakdown of the employee near the start of the story, the breakdown of Callow's car in the accident, the breakdown of societal norms that occurs in his presence when he is thought dead, or his own breakdown at the end that leads to his salvation. The adjective "callow," which is used as the character's last name, means to be inexperienced and immature; Callow the businessman is shown to be both of those in his cold reaction to his employee's tears. 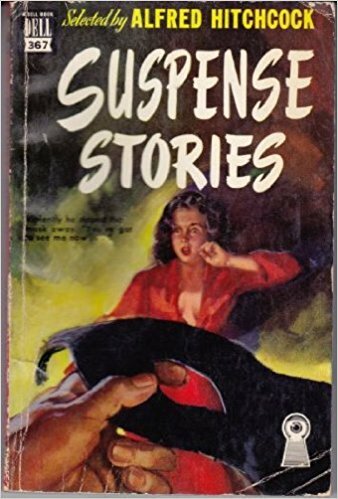 "Breakdown" was collected (along with "Revenge") in a Dell paperback published in 1949 called Suspense Stories, supposedly selected by Alfred Hitchcock (Dell #367). The story was adapted for radio as an episode of The Prudential Family Hour of Stars and broadcast on May 15, 1949, starring Joseph Cotten. This radio show appears to be lost. "Breakdown" was then adapted for television as an episode of the series Suspense and broadcast on October 24, 1950, with a teleplay by Francis Cockrell and Louis Pollock and directed by Robert Stevens. This version also seems to be lost. It starred Don Briggs, not Joseph Cotten, who was still a movie star and whose first TV appearance would not come until 1954. If the 1950 version is found, it will be interesting to compare the teleplay to that used for the 1955 version, since both are credited to Pollock and Cockrell. It is possible that Hitchcock reused the teleplay that was written for the 1950 TV version, since the blacklist of Pollock was in force in 1955. 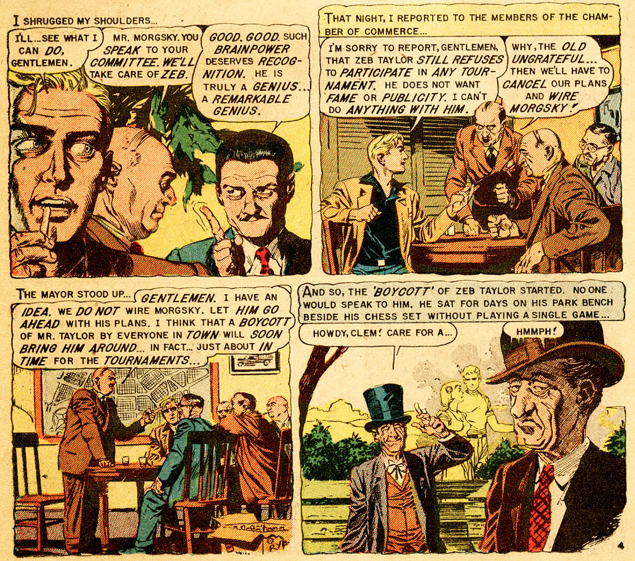 "Breakdown" next appeared twice in comic books in uncredited adaptations: first as "The Corpse in the Crematorium" in Crime SuspenStories #2 (December 1950-January 1951) and then, a year later, as "Grave Business!" in Haunt of Fear (November-December 1951). After this flurry of appearances, all was quiet for four years until it was broadcast on Alfred Hitchcock Presents on CBS on Sunday, November 13, 1955. According to McCarty and Kelleher, Hitchcock had heard the radio play with Joseph Cotten, liked the story, and hired Cotten to reprise his role for television. During Hitchcock's introduction to the show, he is holding a paperback and says that the short story upon which the show is based appeared in the collection he holds. However, a close look at the book's cover shows that it is not Suspense Stories; instead, it is a mock-up of a paperback with the title Wolf Woman Strikes and a picture that would be used occasionally on Alfred Hitchcock Presents when a character is reading a paperback. (See "Nightmare in 4-D," [where the book is titled Night of Horror] and "Insomnia." [where it is called The Bashful Killer]). The show opens with a shot of the sort that is familiar to any Hitchcock fan: an overhead shot of the beach, with hotels lining the sand, as the camera travels along the coast and upbeat music plays. This sets the scene and the next shot brings the location from the general to the specific, as we see Callow and Ed Johnson on lounge chairs. In the short story, Callow is described as being about forty years old and having a "well-nourished breadth"; Joseph Cotten, who plays the role, was fifty years old at the time and had tall, slim build. What is presented through narrative and description in the story becomes dialogue in the show, as the shots cut back and forth from Callow to Hubka, who is back in the New York office on the other end of the telephone, aging, sweaty, and desperate in contrast with the smooth, calm Callow. Oddly, we do not see Hubka crying, though Callow refers to his tears after he hangs up the phone. After a short conversation with Ed Johnson, there is a cut to another establishing shot and we see a highway and a sign showing the road is U.S. 1, which travels from Florida to Maine and which Callow would naturally use to drive back to New York. There is a cut to a shot of Callow driving; the camera is positioned behind the steering wheel so that Callow's face and the large wheel take up the entire frame. Shots of Callow driving alternate with shots from his point of view through the windshield. From this moment on, Callow only speaks in voice over and shots throughout the rest of the show continue to go back and forth from his point of view to his immobile form. Once Callow is paralyzed in the accident, the show becomes a tour de force of direction, editing, and narration. 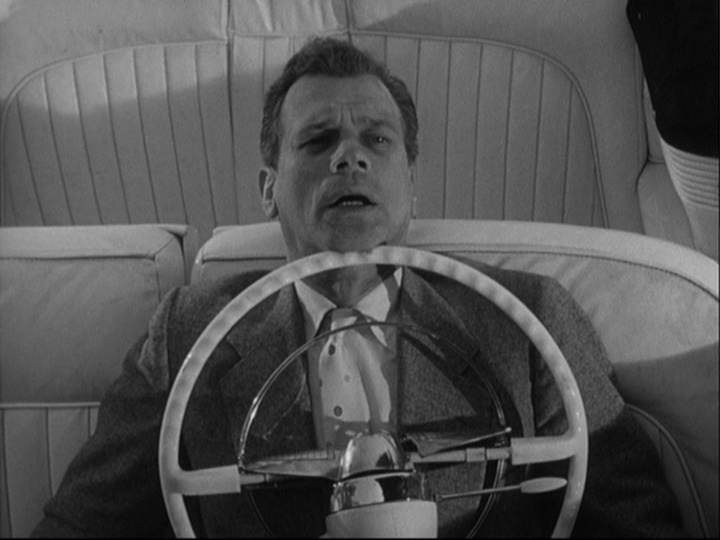 Hitchcock uses a variety of camera placements to show Callow pinned behind the wheel, unmoving, as his voice describes his thoughts on the soundtrack. The contrast between his physical immobility and his active thoughts is displayed by Joseph Cotten's emotional voice performance. 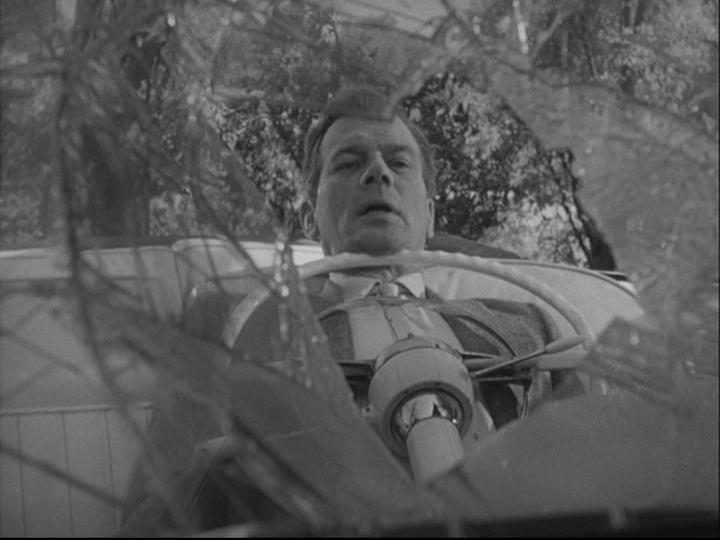 Hitchcock also alternates stills with shots where Callow is immobile but the world around him is seen to move; tree branches sway behind him and soon people come to see him. The order of events in the story is altered slightly, as three men come to steal his car's tires and his luggage before two convicts arrive and pry the steering wheel away from his throat so that they can steal his clothes. "Breakdown" is, in a sense, an illustrated radio show, at least in the parts where Callow is immobile and his narration conveys his thoughts. The sheriff and his crew arrive and it is incredibly frustrating as a viewer to know that the character is alive but to be powerless to tell anyone on screen. In the show's last scene, Hitchcock again establishes the location with a neon sign that reads, "City Morgue," and more shots from Callow's point of view are intercut with shots of him not moving. A sheet is placed over him and he is left alone in the morgue for the night; the camera looks up, as if through his eyes, as the sheet is drawn over it. Point of view is not limited to the visual, however; in one sequence, voices get louder and softer to show that they are approaching and retreating from Callow's form. Finally, he cries and the coroner sees the tears, which are displayed in two ways: both as they run down Callow's face and as they run down the lens of the camera in a shot from Callow's point of view. "Breakdown" is an experimental show even when seen today, more than 60 years after it was filmed. Ulrich Rudel called it "one of the most audacious formal experiments of Hitchcock's entire career." Donald Spoto wrote that "Breakdown" "summarized the motifs of sudden punishment and the terror of enclosure, immobility, and madness." Steve Mamber pointed out that the "central situation remarkably anticipates North By Northwest . . . In both, an unfeeling, overly assured businessman is plunged into chaos by the flimsiest of coincidence, and finds new capacities for feeling as he struggles to stay alive in a freshly hostile world." Comparing Joseph Cotten's character in "Breakdown" to Cary Grant's character in North By Northwest is perhaps unfair to the Grant character, who seems more clueless than unfeeling. Hitchcock and his editor, Edward Williams, use various methods to get around the immobility of the show's central character and to propel the story forward toward its conclusion. Hitchcock must have planned every shot in advance, since there are a good variety of angles and distances that keep the shots of Callow's paralyzed form from becoming repetitive or monotonous. Williams won an Emmy in 1956 for this episode in the category of Best Editing of a Television film and it was well-deserved. 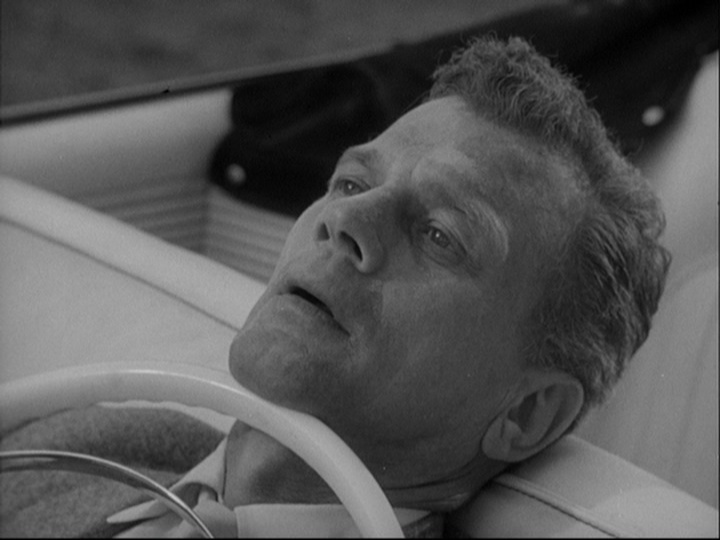 Joseph Cotten (1905-1994) was born in Virginia and was on screen from 1937 to 1981. Among his many great films in the 1940s were two directed by Hitchcock: Shadow of a Doubt (1943) and Under Capricorn (1949). He was on Alfred Hitchcock Presents three times, including "Together." Playing his friend Ed Johnson is Raymond Bailey (1904-1980), who started out on film in 1939 and moved into TV work in 1952. 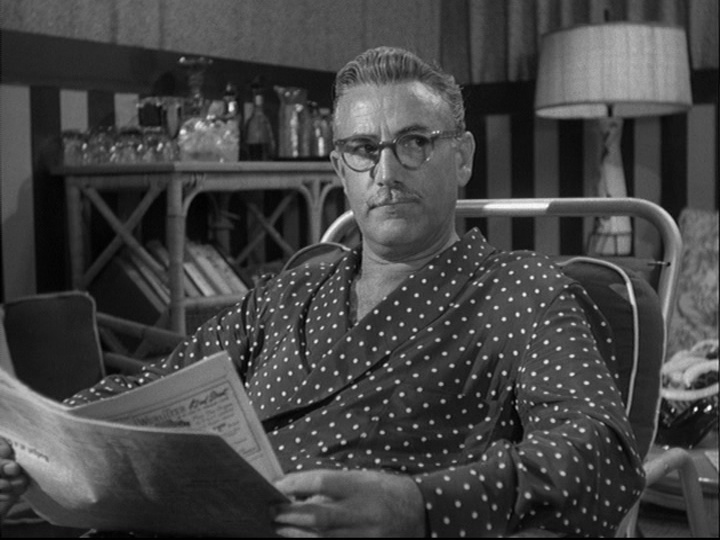 He was in Hitchcock's Vertigo (1958) and ten episodes of Alfred Hitchcock Presents, including "The Three Dreams of Mr. Findlater" and "Backward, Turn Backward." 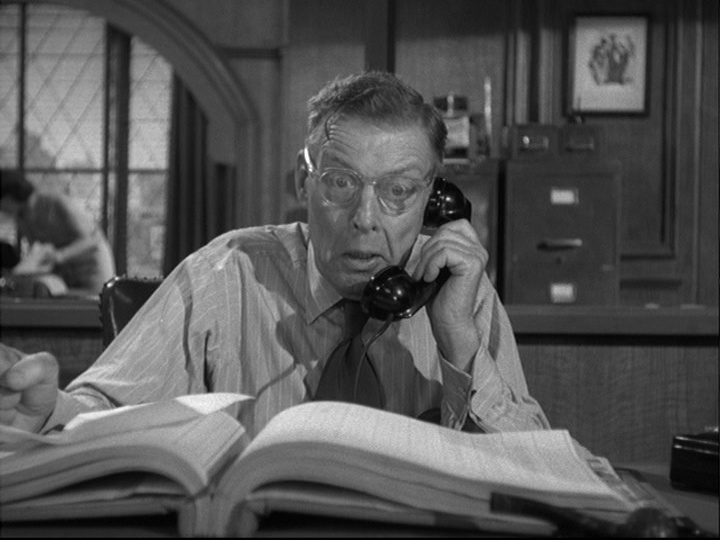 Making the most of a small role as the unfortunate Mr. Hubka is Forrest Stanley (1885-1969); he was in many films from 1915 to 1932 and then had a short stint on TV from 1955 to 1958. 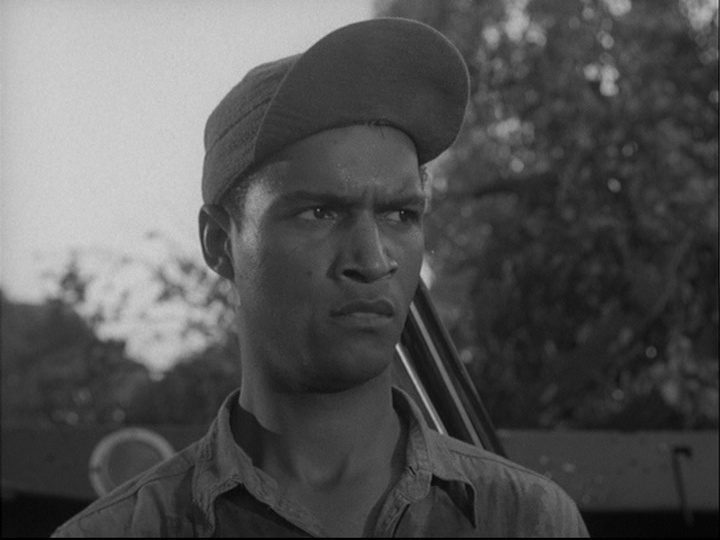 James Edwards (1918-1970) is one of two black actors to have small roles in "Breakdown"; he plays one of the two convicts who steal Callow's clothes. Edwards was on screen from the late forties to the late seventies and was also in one other Alfred Hitchcock Presents episode, "The Big Switch." 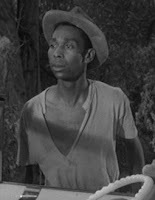 The other black actor in "Breakdown" is Elzie Emanuel (1931-2004), who was on screen from 1944 to 1957. He plays one of the three men who steal Callow's tires and luggage. One of the other men who loots the car is played by none other than Aaron Spelling (1923-2006), who was still in the early part of his career, trying to succeed as an actor. When acting did not work out, he turned to writing in 1957 and then to producing in 1959. Eventually, he became one of the most powerful and successful TV producers in Hollywood, in charge of many long-running TV series such as Charlie's Angels, Beverly Hills, 90210, and Charmed. At the time of "Breakdown," he was married to Carolyn Jones, who would later star on The Addams Family. "Breakdown" was filmed one more time, for the 1980s version of Alfred Hitchcock Presents; it was broadcast on December 1, 1985. Read Louis Pollock's original story here and here. Watch the 1955 TV version online here or buy the DVD here. "Breakdown." Alfred Hitchcock Presents. CBS. 13 Nov. 1955. Television. Grams, Martin, and Patrik Wikstrom. The Alfred Hitchcock Presents Companion. Churchville, MD: OTR Pub., 2001. Print. IMDb. IMDb.com. Web. 14 September 2017. "Louis Pollock Papers, 1939-1964." Online Archive of California. Web. 17 September 2017. Mamber, Steve. "The Television Films of Alfred Hitchcock." Cinema (1971): 2-7. Web. 17 September 2017. McCarty, John, and Brian Kelleher. Alfred Hitchcock Presents: An Illustrated Guide to the Ten-year Television Career of the Master of Suspense. New York: St. Martin's, 1985. Print. McGilligan, Patrick. Alfred Hitchcock: A Life in Darkness and Light. New York: ReganBooks, 2003. Print. Miller, Douglas T., and Marion Nowak. The Fifties: The Way We Really Were. Doubleday, 1977. 316. Web. Pollock, Louis. "Breakdown." Collier's (1947): 14-15, 46, 48+. Www.unz.org. Web. "The Prudential Family Hour of Stars." Web. 17 September 2017. Rudel, Ulrich. "Cinema En Miniature: The Telefilms of Alfred Hitchcock." The Alfred Hitchcock Presents Companion. 97-108. Print. Spoto, Donald. The Life of Alfred Hitchcock: the Dark Side of Genius. London: Collins, 1983. 373. "Television Academy." Television Academy. Web. 17 September 2017. Thrasher, Al. "Writer Cleared After Years of Red List Mix-Up." The Daily Mirror. Web. 17 September 2017. Wikipedia. Wikimedia Foundation. Web. 17 September 2017. In two weeks: "The Case of Mr. Pelham" with Tom Ewell! Walter Gripp can’t seem to figure out how the town at the edge of the dead Martian sea has come to be completely abandoned, but what he does know is that the loneliness isn’t sitting well with him. In spite of his reclusive tendencies, Walter finds the empty homes and quiet streets downright eerie, and it doesn’t help that his long-held fantasies of travelling into the town from his shack in the blue Martian hills to find a nice woman to marry are now properly dashed. Hope rekindles when he hears the distant ring of a telephone—but he answers just in time to hear the call end. A mad scramble throughout the town and a frantic quest to literally call every name in the phone book finally yields reward when he connects with a woman who identifies herself as Genevieve Selsor in Marlin Village before the line goes dead. Walter promptly “borrows” a beetle car the next day and zooms out, reasoning that, as a woman, Genevieve would be most likely to hole up in a beauty salon. And there Walter finds her, in abundance. Far from the “clear vaporous mist” he dreamed of, Genevieve is a pulchritudinous horror in Walter’s eyes, and their status as “last man and woman” on Mars is enough to set his skin crawling. As soon as Genevieve shows him the wedding dress she has all picked out, Walter is back in the beetle car zipping for his shack in the hills, where he proceeds to live in contented solitude for all the rest of his days. 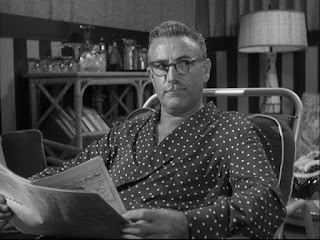 A rare Bradbury adaptation of a more humorous sort, “The Silent Towns” lights a wick of intrigue in a setup that clearly inspired Rod Serling during his composition of The Twilight Zone’s premiere episode, “Where is Everybody?”, (even down to the presence of mannequins) before the story posits the notion of romancing a fat person as being a fate worse than death. 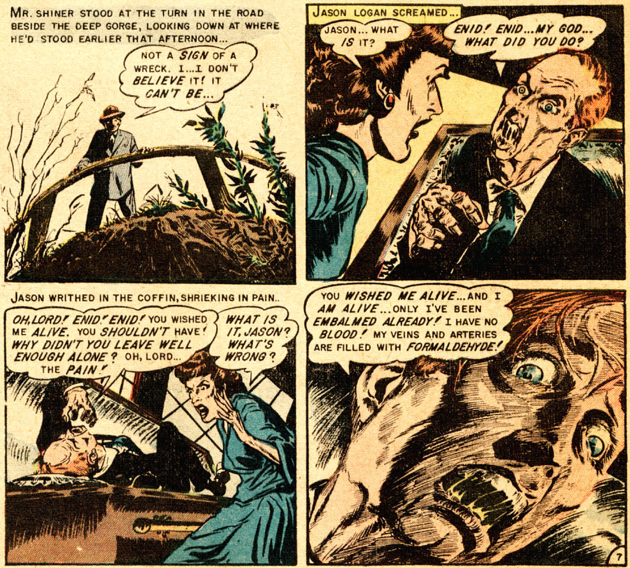 As conceived by Reed Crandall, Genevieve isn’t merely overweight but morbidly obese on the order of Charlie Marno from “Dead Right” (Shock SuspenStories 6). But here the jabs at the character's weight seem all the sharper given the context of Walter’s dilemma: he prefers to live with absolutely no human contact rather than have the companionship of someone whom he finds physically repulsive. This attitude wouldn’t necessarily be terrible if we were given any indication that Walter wasn’t someone whom we should be rooting for, but the rest of the story and the “Pop Goes the Weasel”-tune of the last panel tell us that Walter’s decision should be viewed as jovially affirming our long-held beliefs that fat people are gross and should be avoided at all costs. Don’t believe what the scandal rags tell you: life under the big top ain’t easy, and life in the freak show is a hell unto itself. Every day the band of misfits consisting of Tarpo the Living Skeleton, Aldo the Hairy Ape-Man, and others is trotted out onto the stage to be gawked and sneered at by the patrons who have paid their quarter to come and see the monsters. Bosco the Dog-Faced Boy has had enough of it; approaching Gilby and Smote, the two shysters who run the show, Bosco turns in his two week’s notice but is reminded of his binding debt to the businessmen for the sum of $200. Knowing that he’ll never earn enough to satisfy the debt with the pittance that he receives from the freak show, Bosco downs a heavy dose of sleeping pills and crosses over the Rainbow Bridge. Now out a star attraction, Gilby and Smote take to the streets in the hopes of randomly bumping into some other messed-up-looking mother that they can snooker into servitude when what to their wondering eyes should appear but a dwarf with an upside-down face and two batty ears. The circus men give chase to the creature only to find themselves led into a caged pen where the creature—in actuality Callon-X, a time-travelling showman from Earth’s post-Atomic future—informs Gilby and Smote that they will be the future attractions of Callon-X’s very own freak show. Thanks for laying it all out for us, guys! After the chalky taste that “The Silent Towns” left in my mouth, “The Freaks” proved to be just the chaser I needed to wash it down: unabashedly low class and goofy and not at all afraid to admit it. 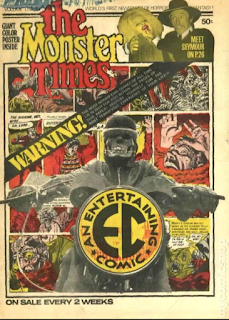 While “The Silent Towns” felt like an assignment that was more suitable to the métier of Jack Kamen, “The Freaks” could have easily been handed off to Graham Ingels for a morbid rebranding of EC’s science fiction stylings, but I’m thankful that it ended up in Kamen’s bin because it lead to the artist conceiving the “special makeup effects” for his star, Bosco the Dog-Faced Boy, possibly the oddest and most distinguishable creation that Kamen ever set to paper. His depiction of Bosco’s trials and travails are the stuff of weepy melodramatics, but damn if they’re not effective. But after Bosco’s surprising Marion Crane-esque first act exit we’re right back in cheap entertainment territory, and the “You’re the freaks now!” clincher that we’ve seen so many times here and abroad somehow manages to feel giddy and wholly satisfying here. After setting down on a foreign planet, a team of space explorers begin to dig through the crusty terrain where they find a massive bone belonging to an extinct lifeform. The astronauts set to their task with renewed ardor, excavating one gargantuan fossil after another and assembling the bones into a replica of the lifeform Smithsonian-style. Two of the astronauts hypothesize that the spores that brought life to this planet are the same ones that jumpstarted the evolution of their own home when the alien planet erupted eons ago. After the skeletal framework has been fully assembled, the space team begins covering it with patches of synthetic flesh like a very upsetting quilt. Satisfied with their work, the astronauts head back into their ship for the homeward journey, removing the suits that reveal them for the face-torso crustaceans they are as they peer out at the titanic replica of a human infant that they have left behind. "You maniacs! You blew it up!" If nothing else in this last issue of Weird Fantasy convinces you that the SF well had run dry for the boys at 225 Lafayette Street by this point, than “The Fossil” will surely get the job done. Laboriously padded even at the minimum 6-page running time, this silly goose of a yarn earns a merit badge on the sole basis of its trippy final panels, throwing a bone to the reader with one last depiction of Joe Orlando’s long-gone mashed-up aliens and the image of a wailing baby patchwork more unnerving in effect than a good many of EC’s horror tales. The furrowed brows it inevitably induces remains as solid a testament as any as to the impression that WF’s swan song leaves upon the reader. for your dramatic death scene. Cruising down the intergalactic highway, Captain Vance Kaye’s patrol rocket picks up indications of a derelict ship nearby and, as Kaye’s first mate knows is par for the course, the rocket pulls in for an investigation. Finding a mass of bodies within in various states of decay, Captain Kaye and Lieutenant Fielding dig out the ship’s log in the hopes that it will provide context to the strange scene. This it does in aces, as it explains that the ship’s crew was forced to seek solace on a desolate planet after an asteroid struck the vessel. Unhappily for them, the desolate planet turned out to be the lonesome prison that Earth had been shuttling its most vile fascistic criminals and radicals to. The marooned madmen commandeered the ship and forced the crew to drive them back home. 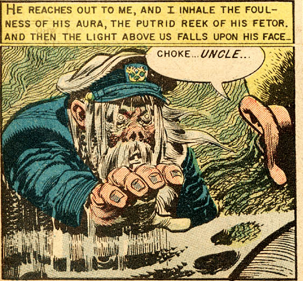 Remembering the brave sacrifice made by his friend Bert and the wife and child he left back on Earth who would fall under the hateful regime of his new passengers, the captain of the ship smashed the ship’s gyro control and sentenced them all to a lingering death by asphyxiation. Finally satisfied that his derelict ship-searching days are over, Captain Kaye voices his thanks to the remains of his father, Captain Kenneth Kaye, for sparing the Earth from hate. Peter: "Derelict Ship" is an interesting failure, one with high moral ground, that starts off intriguingly enough but sputters out with a climax that feels tacked-on. Bernie Krigstein will become justifiably famous from his EC work but space opera could not have been his genre of choice. 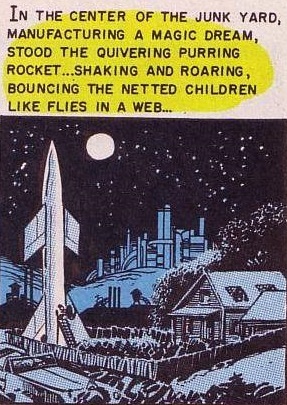 His space explorers and lunar landscape have too much of a Williamson vibe to them. 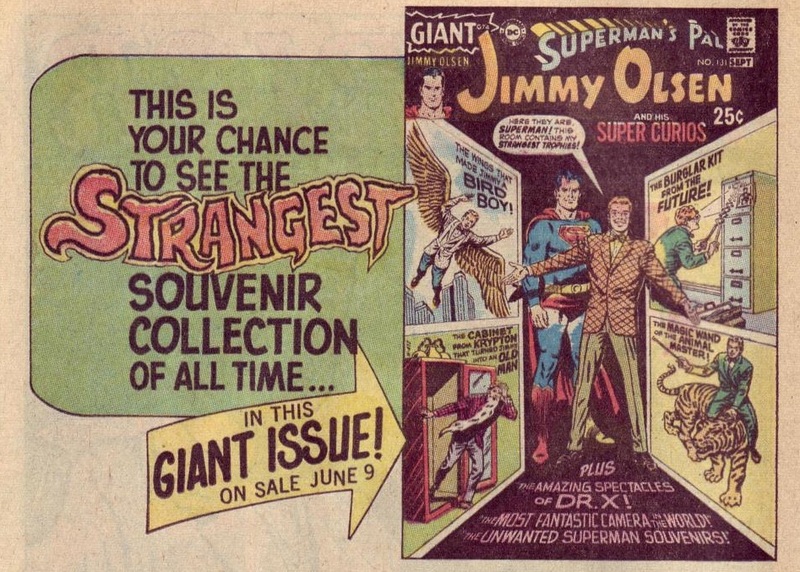 "The Freaks" and "The Fossil" are utterly predictable (and "The Freaks" feels like a patchwork of old EC stories). I had to laugh when, halfway through "The Freaks," Al feels the need to summarize the story thus far. It really wasn't all that complicated, Al. 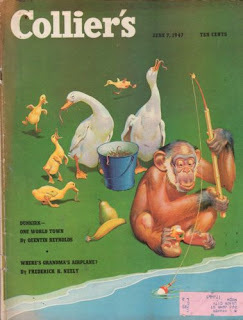 That leaves the one shining light this issue, Ray Bradbury's "The Silent Towns," another Martian Chronicle tale (originally from the March 1949 issue of Charm), one that would have found a hard time seeing publication in today's PC world. I thought that, yep, there's a bit of misogyny and "pleasantly plump" discrimination going on, but isn't it a nice change to see Bradbury end on a humorous note rather than the stuffy, sometimes pretentious message he's used to delivering? 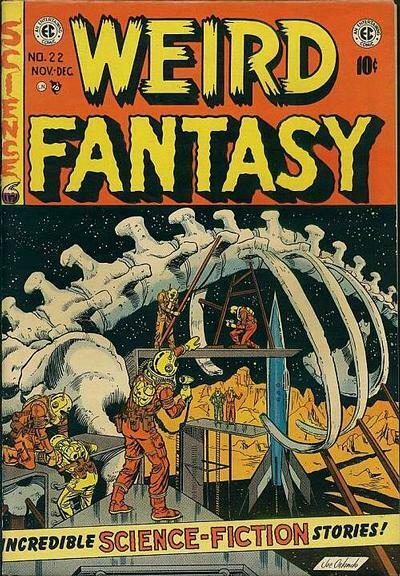 So, other than the Bradbury, the final issue of Weird Fantasy is more vacuous space than solid entertainment. 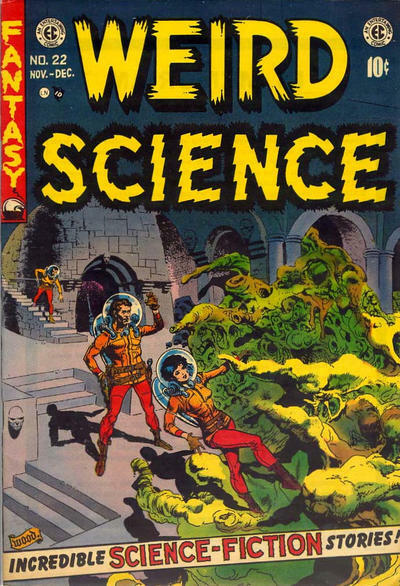 Though WF and Weird Science end this month, the two titles will merge and reappear in March as the quarterly Weird Science-Fantasy. EC will drop the new title on the public with a higher price tag and we'll see how that goes over rather quickly. Jack: The image of Genevieve in Walter's dream in "The Silent Towns" owes much to illustrations on the covers of old pulp science fiction mags but the reality of the last woman on Mars is something much different. While there is some humor as Walter tries to avoid Genevieve's advances, the story ends up seeming little more than cruel. 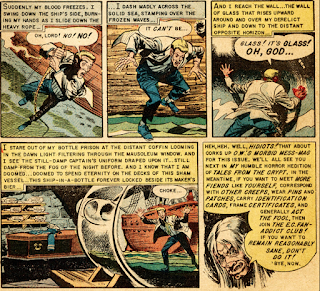 The Bernie Krigstein we see in "Derelict Ship" seems to be getting his feet wet and the art is inconsistent with flashes of excellence; the story is a good one. Anyone but Kamen would have done a better job with "The Freaks," another story with a cruel streak and an old twist. That leaves "The Fossil," about which the less said, the better: it's talky and boring and the ending falls flat. Once living in wealth and grandeur, Enid and Jason Logan now face bankruptcy and losing all the beautiful objects they've acquired over the years. 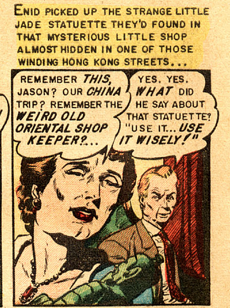 While admiring her collection, Enid discovers that an old jade statuette she'd picked up in China has an inscription at the base, a rhyme bestowing the owner with three wishes. Enid exclaims that she will wish for lots of money but Jason cautions her that he'd read a story once, "The Monkey's Paw," where a woman had three wishes and they came true with disastrous results. Enid scoffs and makes her wish. Just then, the phone rings and Jason announces that his lawyer, Mr. Shiner, has called him into town to discuss a way of stalling the bankruptcy. Enid is elated and convinced her wish has come true. As in "The Monkey's Paw," the wish does come true, but only as a result of the death of Jason in a car crash. 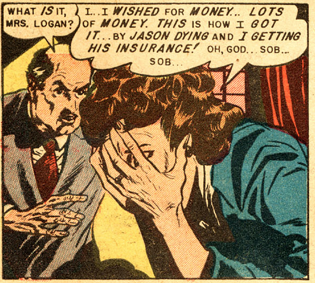 Jason's lawyer arrives to inform Enid of the sad news about Jason but lets slip that her husband's death makes Enid a rich woman thanks to the boatload of life insurance Jason had. Maybe I'll have better luck this time! Distraught, Enid grabs the statue and begins to make her second wish, that Jason come back to life, but Shiner heads her off at the pass, reminding her that, in "The Monkey's Paw," the woman wished for just that and got her son back in the condition he was in after being mangled in a machine accident. Enid wishes for Jason back "as he was immediately before the accident," but a knock on the door dashes any hopes of Jason back in her arms. Three men carry a coffin into the living room and one of the men informs Enid that Jason was dead of a heart attack before the crash. Enid, pondering the wording of her final wish, sends Mr. Shiner away and holds the jade statue, crying that she wants her darling "alive . . . breathing . . . talking . . . moving . . ." Jason bolts upright in his coffin, screaming in agony that his wife has made a mistake. His blood has been removed and now formaldehyde runs through his veins. As he writhes in pain, Enid grabs their rifle and shoots him but the bullet has no effect. She grabs a knife and, hours later, Mr. Shiner finds the woman standing in front of the coffin, little bits of Jason everywhere. And each piece pulses. Al takes the "inspiration" gig perhaps a bit too far this time out, but at least acknowledges W.W. Jacobs and his "The Monkey's Paw" within the story itself. 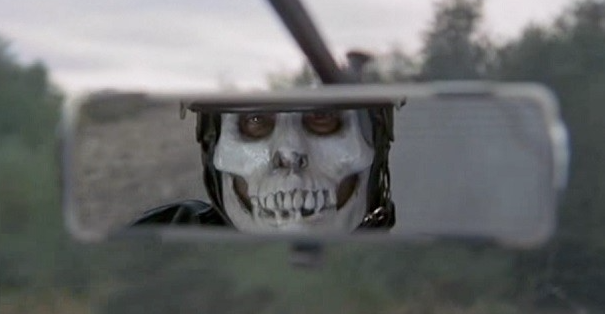 It's tough, for me at least, to read "Wish You Were Here" and not think of the Amicus adaptation that appeared as the fourth story in Tales from the Crypt. 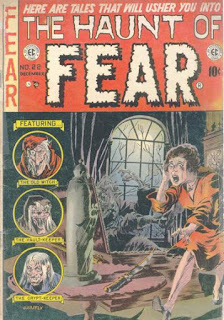 Milt Subotsky did such a great job running his audience through the wringer that I had fears the comic version would pale in comparison. That didn't happen. "Wish You . . ." is the quintessential EC masterpiece, a perfect horror story (granted, Al had a lot of help from W.W. Jacobs) without any of the EC cliches (no corpse rising from the grave, no two-timing money-hungry wife, no villainous embezzler) that might have knocked it down a peg. 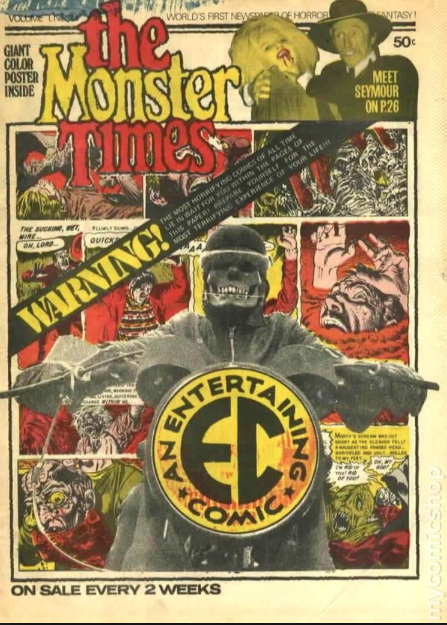 Ghastly is just as on fire as Al here (check out the ghoulish whatsit on the splash), a nice sign since I'd been worrying his work had been slipping lately. Enid's disregard for the money and her wish only to have Jason back is a welcome change from all the adulterous shrews we've had to deal with of late. What we have here is really nasty things happening to nice people. The only thing missing is death on a motorcycle. Top hat of the mourning! Suddenly, the gaiety and the air of festivity that has covered my town like confetti and tinsel, and pink and green streamers is gone, and we all stand about in a hushed terrified silence, staring down at the lifeless body lying in the gutter . 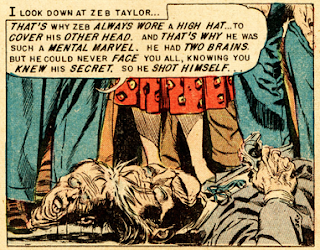 . . the body of Zeb Taylor. Those words draw you in and keep you enthralled right up to the point when we see that Zeb has a second living, breathing head attached to the back of his noggin. Oh, is that all? Evans's heavily-inked, noirish art is gorgeous, some of the best we've seen from him. The queen is not a happy woman when her magic mirror tells her that Snow White is the fairest in the land. She immediately sets her axeman on the comely wench but he has a kind heart and allows Snow White to escape. In the woods, Snow White happens upon the cottage of the Seven Dwarfs and, seeing it needs a bit of tidying up, cleans it from stem to stern. The Dwarfs come home from a day of work at the uranium mine and find the buxom beauty asleep across their beds. Snow White begs them to let her stay and, in return, she'll be their housekeeper. The Dwarfs agree and head off to work the next day. The most gorgeous maid in all the land answers a knock on the door and discovers an old woman selling apples. Impetuously, the girl takes a bite and dies of poisoning. The old woman doffs her cloak and we discover that it's actually the seven little imps, who then get to the business of making their cottage messy again. An absolute hunk of rubbish from page one to six, "Snow White and the Seven Dwarfs" only adds fuel to my argument that EC should have left these "Fractured Fables" to the lesser companies. 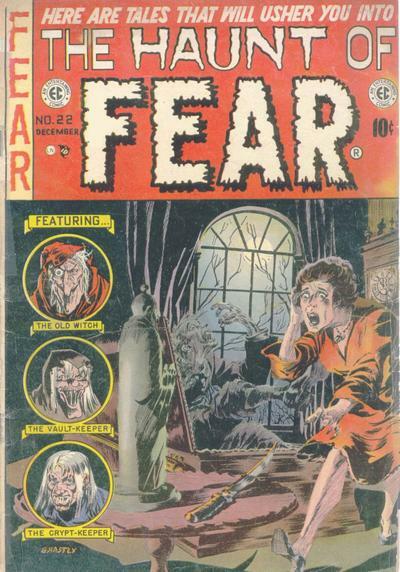 Did Al think the little sight gags (including an upside down message for people who read their comics, um, upside down) and awful rhymes would work just as well in The Haunt of Fear as they did in MAD? Well, he was wrong. If I had been an EC-Fan-Addict in 1953, I'd have stormed the gates. The awfully awful awfulness of "Snow White . . . "
Jack: More like three doubles and a single. After a striking splash page with the Old Witch, the art in the Ingels story is mediocre, and does referring to "The Monkey's Paw" make it acceptable to retell the same old story yet again? The changes don't improve it. Evans's art on the chess story is much better than Ingels's but the whole story builds to a revelation that is a letdown. 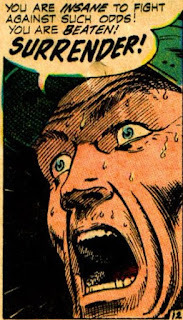 The six pages of the Kamen story read like they're 60 pages; this may well be the worst story we've read so far that was written and drawn by EC regulars. As for the Davis story, when you figure out the surprise ending a couple of pages before it comes, the rest of the story is just passing time. 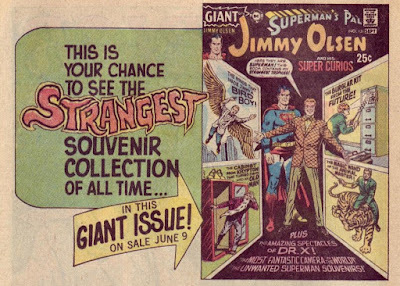 Issues like this and this month's Weird Fantasy make me wonder if EC was running out of gas by late '53 and would have petered out on its own even if the Comics Code had not come along. Jose: Like Peter, my thoughts concerning “Wish You Were Here…” are inextricably bound to the 1972 Amicus production, a film incredibly important to my development and one that left a lasting impression on me ever since I stayed up one fateful evening to excitedly record its airing on AMC’s “Fear Friday” block. And though there are things that I really like that the film added and/or changed, I would say that in the end it’s just a matter of me enjoying each version for their own individual reasons. 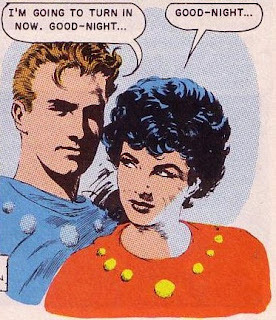 Case in point: the relative innocence and purity of the characters, much like that of the White family in Jacobs’ source material, greatly bolster our sympathies for Enid and Jason here. Sure they may be a little vain and materialistic, but Enid’s genuine anguish over her husband’s death is like a breath of cold, refreshing air next to all the plotting trollops we’ve had to deal with. You get the sense that it’s her profound love for her husband that pushes her to do what she does in the end, and that makes all the difference in the world. The first two-thirds of “Wish…” may very well come off as old hat, but it’s that final part where the story sails right into EC territory with Jason screaming over his acidic veins and Enid deliriously chopping him down into quivering mush because she just doesn’t know how else to end her husband’s pain. It’s the stuff nightmares are made of. The rest of the issue is pretty much the standard fare of the day. “Chess-Mate” reels us in with the mystery at the nub of its plot because it’s all so unusual, but then cuts it off at the knees with another play on the Siamese twin gambit, though it must be said that Feldstein does such a good job of building the momentum that it carries us through the familiar finale. My palate for trash must have become desensitized over the course of this marathon, because I didn’t think that “Snow White…” was nearly half as bad as Jack and Peter claim. I could easily point to at least five stories from Mad that look DOA compared to the silly shenanigans on display here. I think that the story’s presence in one of the company’s horror mags is probably the source of at least some of the discord, but otherwise I think this was a perfectly harmless and occasionally funny yarn. If I didn’t know any better, I’d say that “Model Nephew” was a lost episode from 90s kid TV staples Goosebumps or Are You Afraid of the Dark? It’s a strictly PG affair with the faint exception of Sidney’s murder and features a nutty comeuppance that would have been perfectly at home in either of those series. James Dean and Liz Taylor. In a jungle somewhere, a man warns a woman to keep an eye on a futuristic machine's gauges, lest it blow up. Alone at night with the machine, the woman thinks back to how they got there. Both came from the world of the year 3049, when machines had replaced love and babies were born through technology. The woman and the man had felt rebellion in their hearts and wanted to escape the cold world of science, so when an old scientist showed them a time machine, they jumped at the chance to return to the prehistoric age with a propagation machine for "A New Beginning." Once back in time, however, the woman convinced the man that they should forget the machine and take the more natural route toward progeny. The unwatched machine blows up and Adam and Eve are left to start a new line of people. I can't believe I fell for the old Adam and Eve bit again! I guess it was the dazzling art. 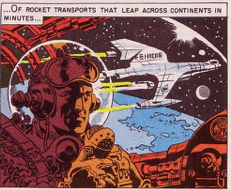 EC historians have concluded that four artists worked on this story, but only Al Williamson signed it. 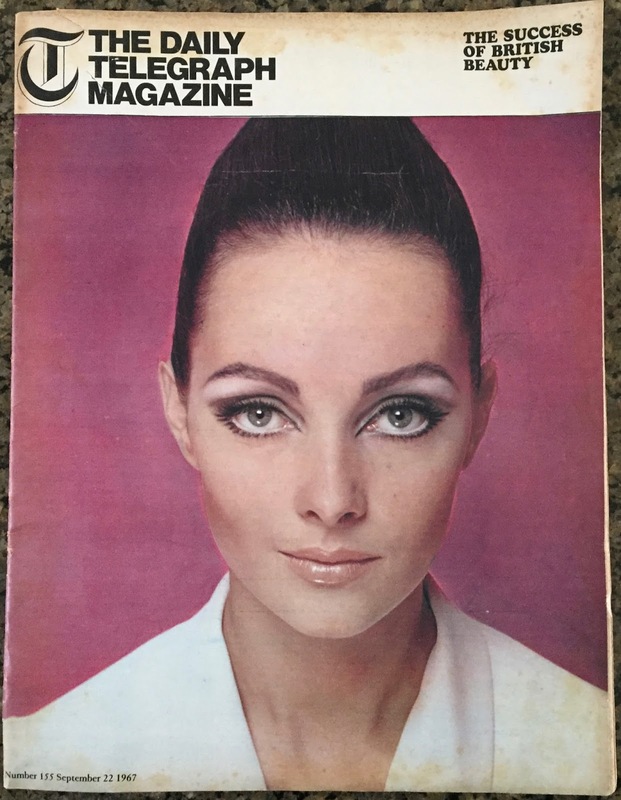 I don't know who did what, but it looks very good and Eve really looks like Liz Taylor in at least one panel. battle their way through hair. Another nut case is brought into the insane asylum's lab for treatment, where the doc hooks him up to a diathermy machine for treatment. No one knows why, but once this machine is turned on and the skylight is opened, miracle cures happen! The doc doesn't know about "The Headhunters," a group of tiny spacemen on a tiny spaceship who are summoned by the machine and fly into the patient's brain to destroy the microscopic monsters driving him crazy. I had to go online to see what a diathermy machine is, and it looks like it's basically an electric heating pad. 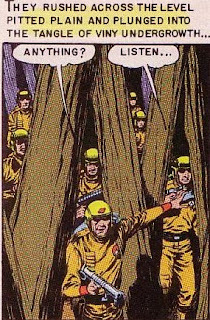 Very sharp art by George Evans helps make this story enjoyable, though when the spacemen began marching through a jungle of what looked like human hair I had a pretty good idea of what was going on and thus the ending was no big surprise. 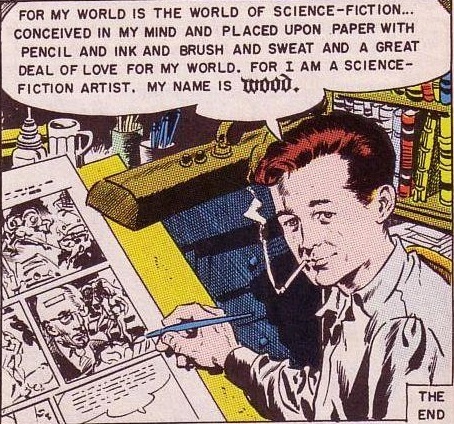 Wally Wood takes the reader on a tour of "My World" in a plotless yet gorgeous six pages of examples of things that happen in science fiction stories. I have no idea how this "story" came about, but it's a display of Wood's mastery of everything having to do with science fiction art, from beautiful women to horrible monsters. Tired of being an "Outcast of the Stars," Fiorello Bodoni buys a full-size model of a spaceship with money he's saved while running his scrap metal yard, determined to reach outer space despite his lack of money. He works hard to remodel the ship and then takes his children on the ride of a lifetime through outer space. He returns home safely and his wife, who had been against what seemed like a waste of money, understands that he has given his children a gift--in what is essentially an amusement park ride, a spaceship that simulated a trip to the stars while never leaving the ground. 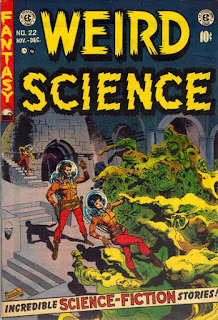 Peter: "Outcast of the Stars" (which first appeared in the March 1950 issue of Super Science Stories) has on display all the qualities that have made Ray Bradbury one of the most beloved writers of the 20th Century; there's a fabulous sense of wonder and, magically, a nostalgia for a time that has yet to come (does that even make sense?). "A New Beginning" features a mélange of great artists but the entirety left me cold. Yeah, I love Frazetta and the gang just like the rest of you but there's way too much "posing" going on and not enough of a good story to hang all this talent on. 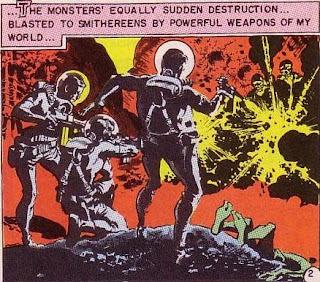 I'm not sure I understand the twist of "The Headhunters" (are these little guys summoned from the great beyond by the diathermy machine and then, when finished with their mission, fry their way out of the patient's brain?) but I loved the eccentricity of the adventure. The most well-known of this issue's quartet is Feldstein's loving "bio" of Wally, "My World," a series of images rather than a story. Taken as a cataloguing of Wally's greatest hits (including the Korean orphan from "A Baby! "), it's an enjoyable anomaly. What a great place EC must have been to work for if the powers-that-be would okay such a square peg. 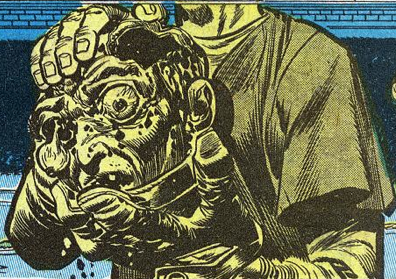 Unlike Weird Fantasy, Weird Science goes out on a high note. THE BEST EC STORIES OF 1953! Next Week . . . I'm back again with yet another rarity from my Caroline Munro collection, a continuing series here on bare•bones. 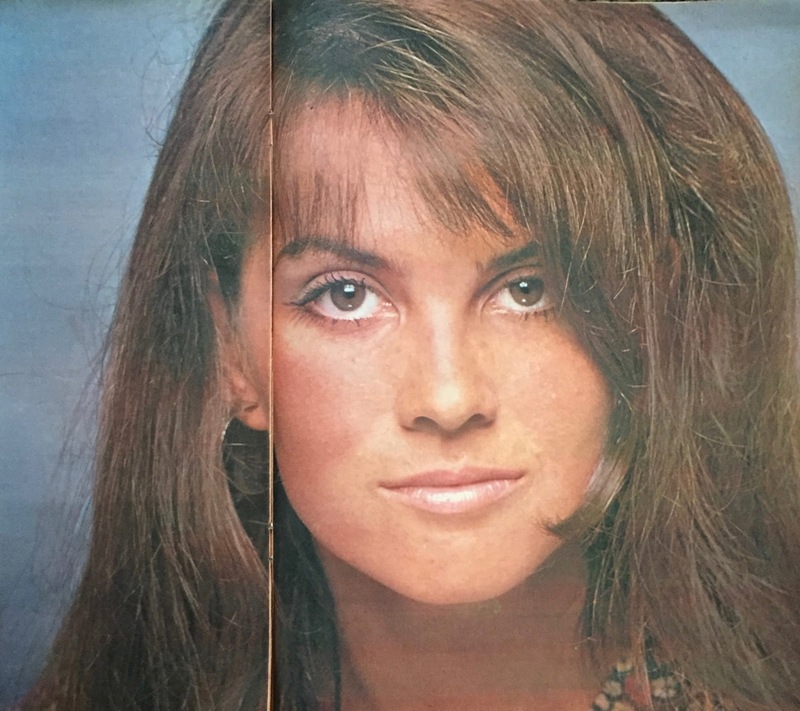 50 years ago today, an 18 year-old Caroline Munro was featured in an article on "The Success of British Beauty" in The Daily Telegraph Magazine. Alongside a brief write-up were 7 lovely photos, included below. Caroline Munroe (sic) 18, is a model girl and a small-part player in films, including Casino Royale. She evolved her own make-up techniques. Her private-life make-up usually consists of bright orange or pink lipstick, masses of mascara on the upper and lower lashes, eye shadow, and nothing else whatsoever. Off-duty, she particularly dislikes wearing a make-up which labels her unmistakably as a model because she finds that the top girls avoid such obvious professionalism. “What the top girls have learned to do is to look pretty and to walk well, but there is nothing gimmicky about them,” she said. 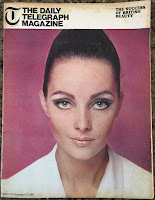 For a demonstration in sheer style, she admires Rita Tushingham and Jean Shrimpton. 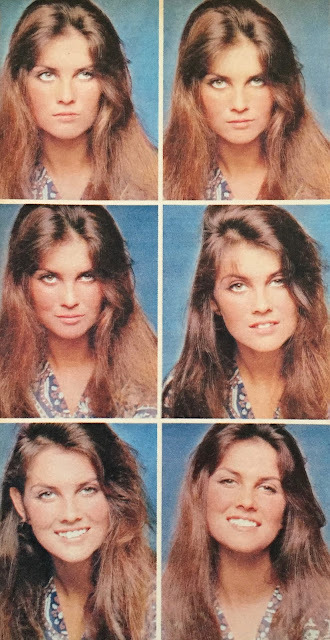 Watch for more Caroline Munro rarities here on bare•bones, and be sure to check out the prior entries in this series! "The Defeat of the Spanish Armada"
Jack: The men of Easy Co. follow Sgt. 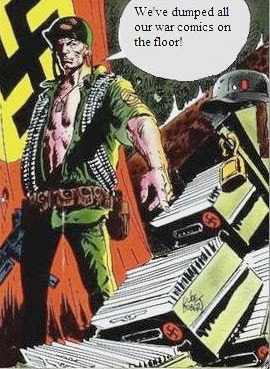 Rock into a town held by Nazis and, when the shooting starts, Rock is captured by a Nazi major who thinks that if he can get at what motivates Rock he can figure out how to win the war. Realizing that the sergeant's weak spot is his men, the major chains Rock to a post on a balcony and demands that his men surrender. Despite Rock's order to "Dig In, Easy!" the men throw in the towel and let themselves be brought before the major--or so it seems. 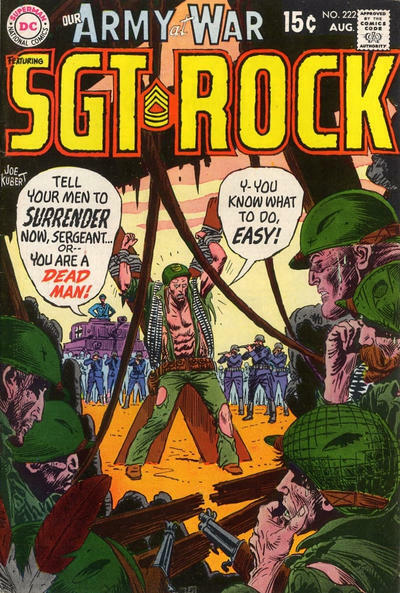 Before you can say "Trojan horse," Rock realizes that some of his men are impersonating Nazis and have "captured" the rest of his men; the disguises are discarded, the Nazis are defeated, and the major is subjected to a lecture by Rock about the strength of the common soldier. Where to begin with what's wrong with this story? Perhaps it starts to go off track during the initial attack by Nazi soldiers, where Rock tries to save the newest member of Easy Co., whom he refers to as "the kid" and who is not even given a name, much less remembered after that page. The major's plan is unclear and the heavy-handed "crucifixion" of Sgt. Rock seems rather pointless. 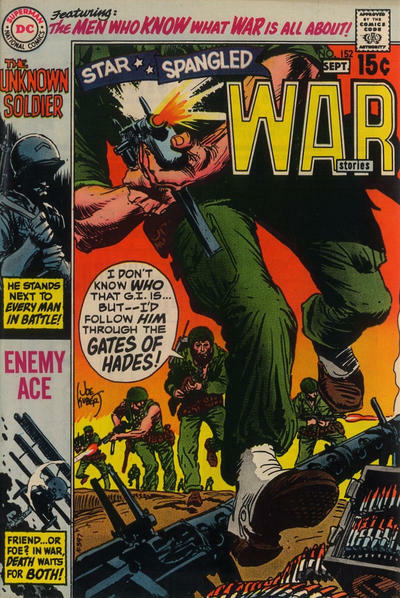 The idea that members of Easy Co. could impersonate Nazi soldiers successfully--including Wildman, with his bushy red hair and beard--is ridiculous, and the concluding fight is so perfunctory that it might as well be the conclusion of an entry in Hunter's Hellcats or the Losers. 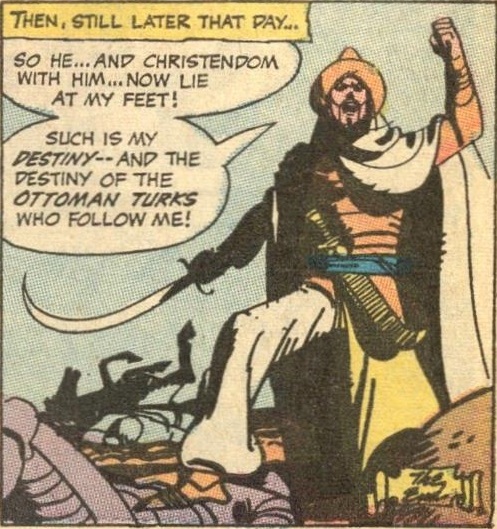 Perhaps letting Joe Kubert write his own stories is not a great idea. In 1588, the British fleet manages "The Defeat of the Spanish Armada," aided by favorable winds. There's not much to this four-page entry in The Great Battles of History, but it passes pleasantly enough. After the Battle of Leyte Gulf in the Pacific during WWII, the U.S.S. Rake is sending up "Black Smoke" because the engineers below deck aren't taking good care of the engines. Chief Water Tender Harry Nugent tells them to knock it off but they laugh at him, thinking that he's old-fashioned in his concern that black smoke is like a black flag that attracts the attention of enemy ships. Little do they know that a Japanese ship twenty miles away saw their smoke and sent missiles that are about to destroy the ship! 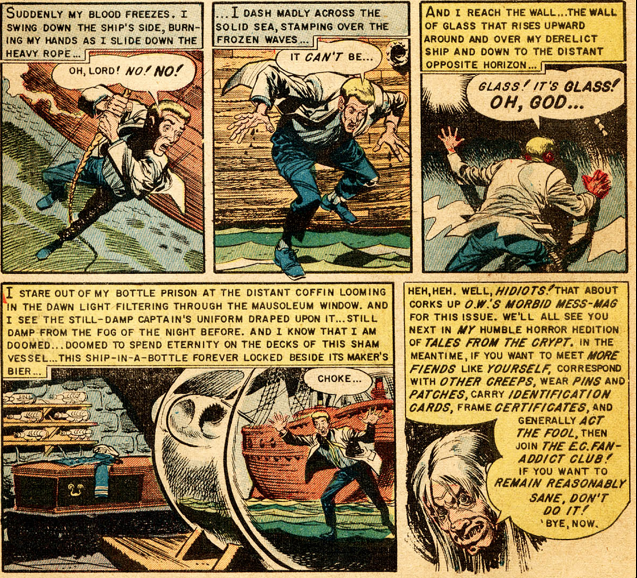 In this month's letter column, editor Kubert remarks that Glanzman was on a ship like the U.S.S. Stevens and many of his stories are based on true events. This one is particularly interesting, even if I still don't quite understand the cause of the black smoke. Peter: Good rough, tough Rock this time out, but I wish that Joe had taken the bull by the horns and allowed these stories to have some carryover. There's no sense of an event in one story having an impact on the next (and, yes, I remember that Kubert has explained that the Rock stories follow no chronological order but why not a multi-parter?) so it's near-impossible for the secondary characters to become familiar and Easy fatalities leave us shrugging. "The Defeat of the Spanish Armada" tries hard but can't break through my interest barrier (and the tempo of Estrada trying to cram a full battle into a few pages comes across like a grade-school re-enactment), something "Black Smoke" does with ease. Sam Glanzman is hitting a bulls-eye with story (if not art) every time out with these little anecdotes and episodes from his military years. Glanzman died in July at age 92. Peter: Ol' Pop Peters keeps the children at the convent entertained with stories of his tank combat in World War I. 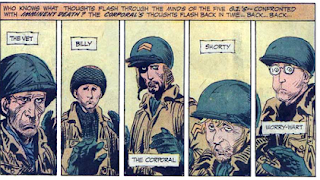 Trouble is, they're only stories, as Pop was too young to see battle in the Great War and now he's too old to fight the Ratzis as Commander Jeb Stuart is kind enough to point out. But Pop sure can fix a tank and the Jeb rolls out of the convent yard as fresh as a French daisy. After the Haunted Tank is ambushed by a pair of Tigers, the Ghostly General pops up for more veiled advice and predictions, this time informing his descendant that "the past and present will fight in one battle!" Gee, thanks, General! The Jeb narrowly avoids destruction but another fleet of Nazi tanks heads for the convent, its General convinced the structure hides an "artillery observation post." The Jeb manages to blow all but one tank to hell, but the remaining tin can heads into the churchyard, bent on total annihilation. It's up to Pop Peters to save the day. "The Iron Horseman!" is built around a schmaltzy script, one that climaxes with a total groaner (after Pop is wounded in the battle, we discover the only person with the same blood type is the mother superior, who thankfully does not have a guitar within reach), but I'm glad that Big Bob managed to work in a response to Pop's assertion that he couldn't be considered a man without seeing combat with Jeb's curt, "You don't have to fight to be a man, Pop!" Just one lone panel afforded to our ghostly bodyguard and the crew of the Jeb are reduced to cameos as well. 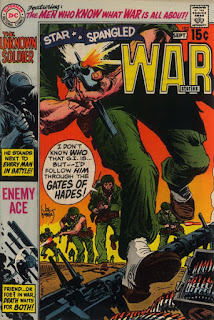 Russ's art here runs hot and cold; the battle scenes are customarily excellent but the convent scenes staring Pop invite comparisons to Andru and Esposito. Tommy never tires of hearing his great-granddad's stories of serving with General George Washington in the Revolutionary War as a bugler-boy. 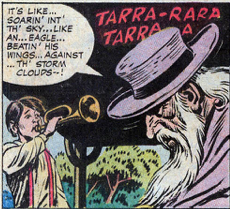 When the old man dies, Tommy picks up the bugle and heads for the Civil War but discovers that the bugle is an antiquated weapon. In the end, Tommy uses the instrument to rally a weary regiment to victory. If "The Iron Horseman!" was a bit . . . saccharine . . . then "Taps for a Bugler-Boy!" is a bowl of Cocoa Puffs drowned in a bath of syrup. It's tough to get past Fred Ray's increasingly annoying and ugly doodles but it seems like the bugler-boy angle has already been done . . . and much better. Jack: "The Iron Horseman!" has a great opening as Pop is introduced as a storyteller and remains entertaining to the end. 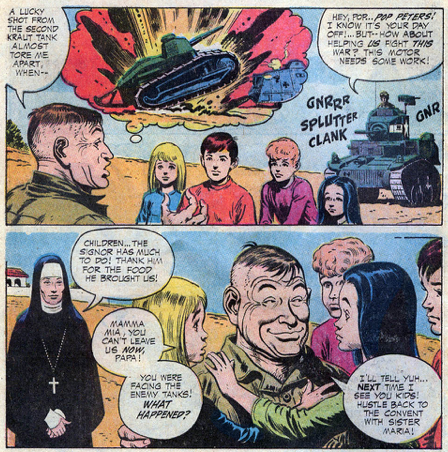 Maybe I'm a sap, but I enjoyed this sentimental tale more than any Haunted Tank story in quite a while. "Taps for a Bugler-Boy!" is also sentimental but it's not helped any by Fred Ray's art. Still, I welcome the connection between the Revolution and the Civil War as embodied by the old man. Jack: Why are the Losers being tried before a Court Martial, accused of desertion under fire and at risk for the death penalty? They had taken ammunition by jeep to a French outfit under enemy fire when a Nazi plane blew the French to bits and the dying French commander told the Losers to fall back and hold a nearby town. 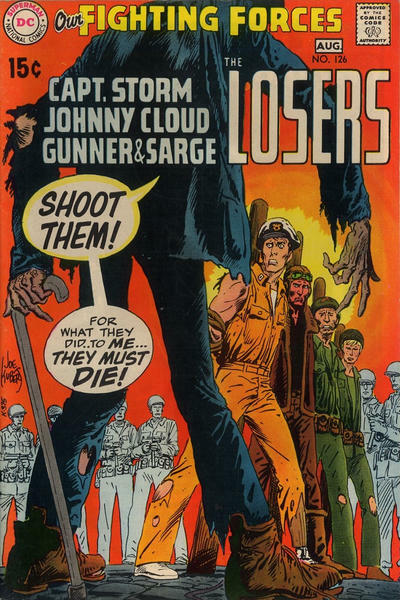 The Losers hop back into their jeep, bring down the plane with a blast from a bazooka, and head for the town, which turns out to be named Perdu. Can the Losers do anything to help "A Lost Town"? Not much, it seems, since it is deserted. But wait! Here come a blind old man with a blind boy and girl alongside him. Why are they the only people left in town? Who knows? The Losers stow their new blind friends in a building and go out into the streets to defeat a Nazi tank and Nazi soldiers on foot. Why are the Nazis shelling and attacking an abandoned town? 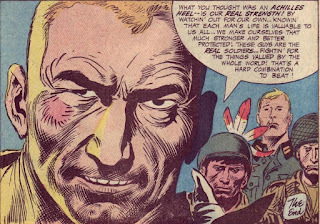 Ask Bob Kanigher! Of course, the Losers quickly dispatch of the much larger Nazi force and liberate the blind trio, who run their hands over the faces of the Losers in thanks. Back to the present, and the Losers stand accused of failing to deliver the ammo to the French post that was wiped out. No one believes the story abut saving the blind trio until the sightless folks appear in court and identify the Losers by feeling their faces again. Later, at a cafe, the blind old man asks the Losers to rename Perdu and Johnny Cloud suggests renaming the town, "The Losers"! 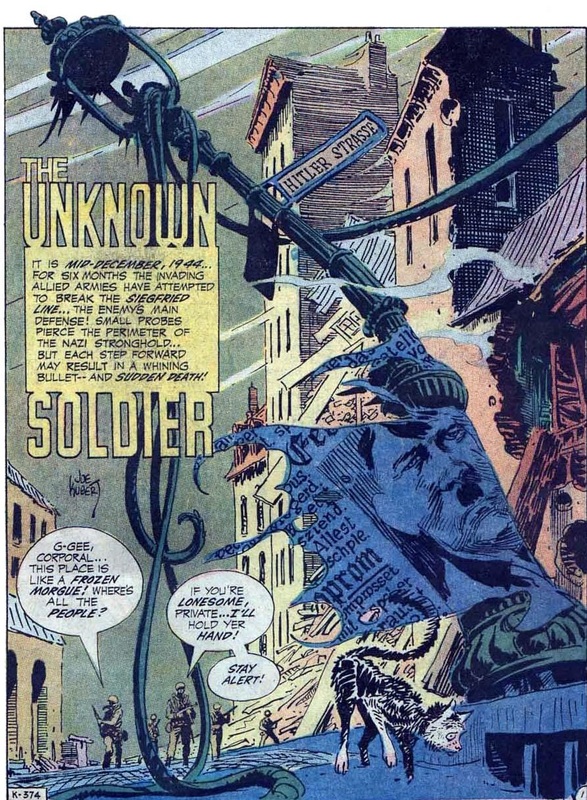 Can we take a minute to deconstruct the current DC war story, of which "A Lost Town!" is a good example? It usually starts in the middle of the action and sets up a seemingly unlikely situation, like the Losers being Court-Martialed. Pages 4-6 go back in time to show how they got there. Page 7 begins with "Conclusion," as if a long and complicated story has already been presented and finally we're reaching the exciting climax. We then bring matters back to the present, at which point we see that the initial situation was ridiculous and someone comes along to clear everything up. It's all kind of rushed. 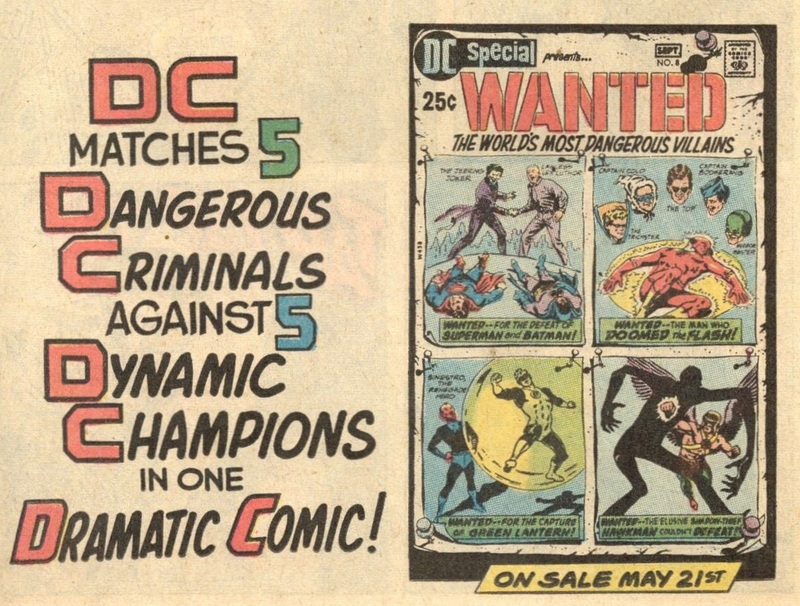 At least Andru and Esposito's art continues last issue's trend of not being as annoying as it was in the '60s. When a mine-sweeping ship is blown up, everyone thinks it was due to a mine, but the captain of the U.S.S. Stevens figures out that the Japanese have a gun hidden in a cave. He draws fire to locate it and then uses guns "1-2-3" to blow it up. Another story of the Stevens, another relatively interesting incident, but don't look for well-drawn humans or much (any) character development, because you won't find it. "The Fall of Constantinople" occurred in 1453 when Sultan Mahomet II and his army laid siege to the great city, the last bastion of the Roman Empire. Justinian fought bravely but when he was killed it was all over for the Christians. I read the abridged version of Gibbons's Decline and Fall of the Roman Empire, so I find these stories interesting, but there's not a lot that can be done in four pages. Attack city, declare victory. The end. Peter: Always wiz zee peegeon Eengleze/Fronch accents . . . it makes me geegle! As a matter of fact, the story makes me giggle as well. Thank goodness Captain Storm's leg has already been replaced with wood as he takes a shot at least once an issue, it seems, and it's always in the fake drumstick. This one moves at a snail's pace and seems to hit just about every beat we've been exposed to already on our journey. Just a few installments in and this series is already out of gas. Does not bode well for the future. 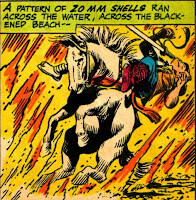 Though I didn't care much for Ric Estrada's history lesson this issue (and that could be down to my short attention span when it comes to 15th-Century battles), Sam Glanzman continues to drop interesting nuggets with his U.S.S. Stevens series. These are just the right length for my little brain. Peter: Five G.I.s stop in what they presume to be an abandoned town for a well-deserved round of ales and get a huge surprise when a band of Ratzis storm in and get the jump on our boys. Luckily, one of the Joes is the Unknown Soldier, super-secret Allied agent called in by the government to impersonate a Corporal and motivate the grunts. The G.I.s are lined up and are about to be shot when an emaciated man steps from the shadows, wearing the Star of David and identifying himself as an escapee from a nearby concentration camp. The Nazi commander orders the ex-internee to kill the American soldiers but the man, instead, levels the Commander, leaving the door open to action on the American front. The Ratzis are defeated and the Unknown Soldier returns to Washington to await his next assignment. 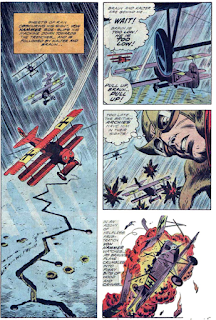 The Unknown Soldier could be the closest we'll get to a consistent level of excellence now that the Enemy Ace has pretty much flown his last mission. "Instant Glory!" is an exciting and well-plotted installment that could have been made so much better by a few more pages; its climax seems rushed after a nice, tension-filled build-up. 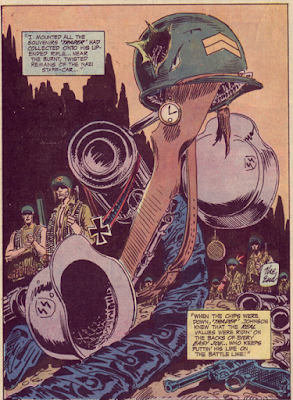 The final panels, which show the Unknown Soldier holding up the tattered remains of the POW's shirt, are particularly potent. On the letters page, regular Gary Skinner (who always came up with interesting points) lauds the Enemy Ace series but bemoans the shortening of page count that occurred towards the series' end. I'd agree completely but Kubert subtly tells Skinner that, to please more readers, there needs to be more than one story. Hans von Hammer is given orders by the pompous Colonel Schlein: send pilots into the vicious storm for reconnaissance and come back with the information on nearby enemy trenches. Knowing he can't send fresh pups out alone on what he considers a suicide mission, the Enemy Ace informs two of his newbies they'll be accompanying him on an observation run. The trio fight the elements but manage to locate the newly-dug trenches. One of Hammer's cadets is shot down and the other is struck by lightning but the Hammer of Hell returns with the vital information, a look of disgust across his face for his disinterested Colonel. Though "Rain Above--Mud Below!" is a stellar achievement and stands with some of the best of the Enemy Ace stories, it's got a weird vibe to it. 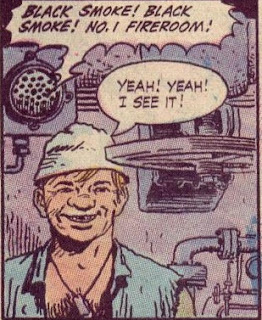 That could be because the writing chores are handed to Joe and art to Russ, a combo we've seen on other strips but not, unless I've forgotten, on this one. Joe does a little monkeying with Heath's art here and there, most evident in the very Kubert-esque fury on Hans's face in the final panel. 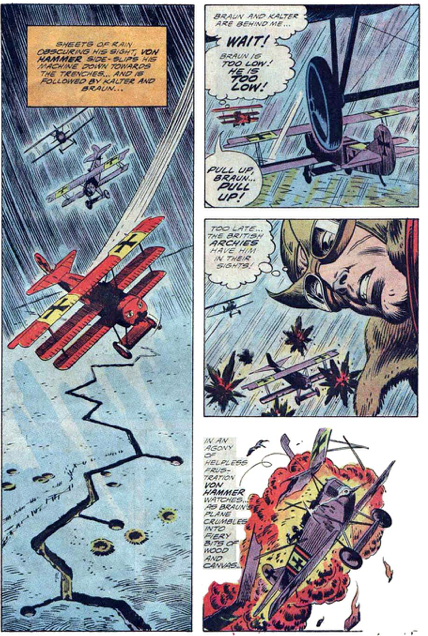 This would prove to be the last chapter in the Enemy Ace saga until Hans pops up in SSWS 181-183 for a team-up with Steve Savage, Balloon Buster. Hans, you may have been the enemy, but I am sure going to miss you. 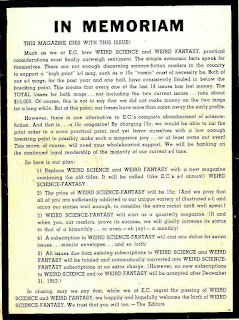 Jack: Overall, this is a terrific issue of SSWS! I have to reproduce the beautiful, Eisneresque splash page below--with its bent lamp post and alley cat it sets just the right tone for a story that takes place near the end of the war. 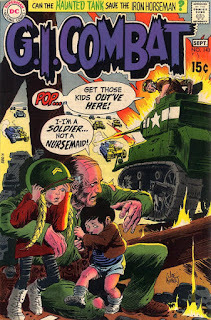 The Kubert art is stellar, some of the best we've seen from Joe recently, and is this the first time we've seen someone from the camps? 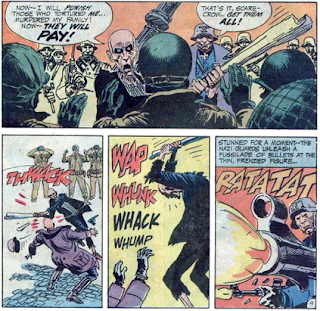 I question the wisdom of a Nazi officer giving a camp survivor a weapon, but it works dramatically. 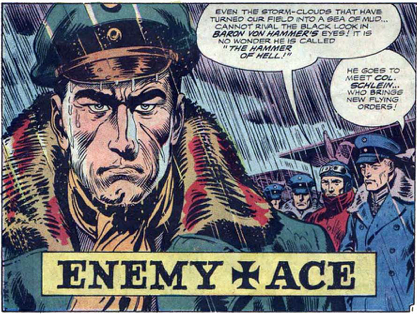 The Enemy Ace story is also very good, just not quite up to the Unknown Soldier story. I see Kubert's hand in several places and guess that he wanted to make sure von Hammer's face had a consistent look. 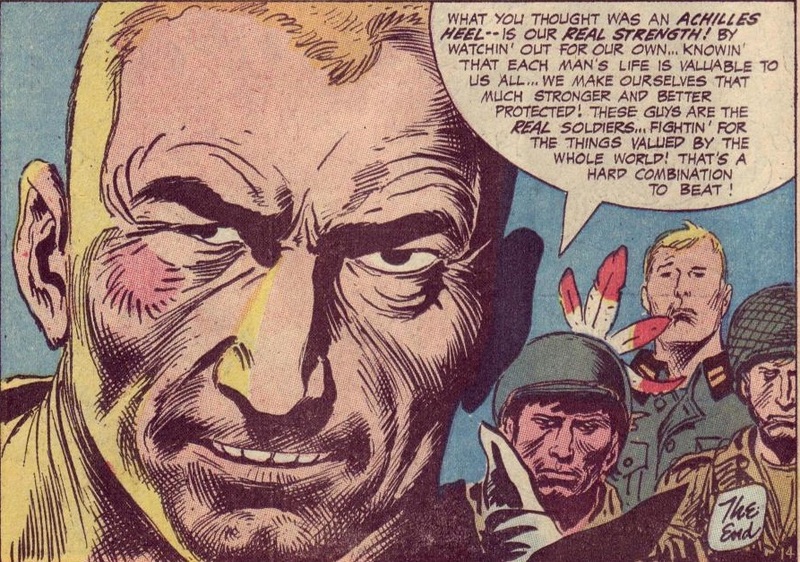 I like the way that Kanigher backs off the verbiage and lets Heath tell parts of the story visually. It's a fitting sendoff for our German friend. Jack: Sgt. Rock and Easy Co. are trying to hold a small village in occupied France where the Nazis stored food. As they await reinforcements, the Nazis attack! 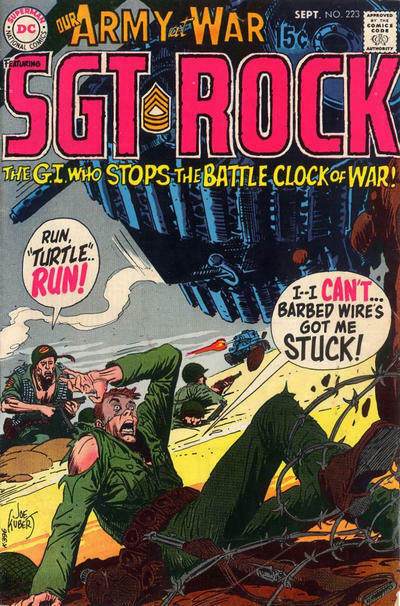 Rock must contend with a new recruit who soon earns the nickname "Turtle," because he seems to move slowly. Will the reinforcements arrive "On Time!" or will Easy Co. be blown to bits by the incoming fire from Nazi infantry and tanks? Things are looking dire until Turtle takes it upon himself to rush an enemy tank, destroy one of its treads with a well-placed grenade, and drop a smoke bomb down the hatch, allowing him to march the tank's crew into Easy's hideout at gunpoint. The Nazi tank commander reveals to Rock that the house where they are hiding sits on top of a huge, hidden ammo dump, and the men of Easy Co. make good use of the newly-discovered ammunition to wipe out the attacking Nazis. Decent art by Heath helps elevate this story above being just another tale of a new recruit with a funny nickname. Rock and Easy Co. have an amazing ability to survive despite incredible odds. 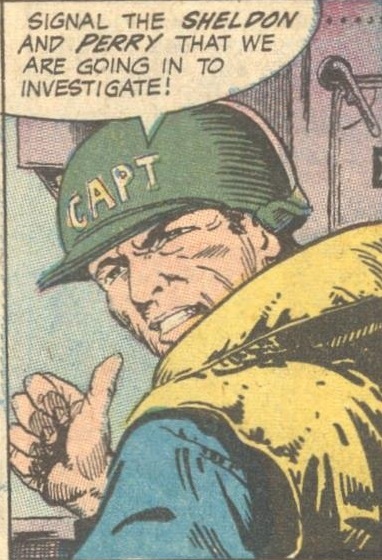 At least Kubert and Co. have stopped killing off the new recruit of the issue every time. As 1944 dawns, Allied ships attack the Marshall Islands. Suddenly, "The Kunko Warrior" appears--a Japanese soldier in traditional dress riding a white horse! Shelling of the islands continues from the ships and he disappears into the flames. 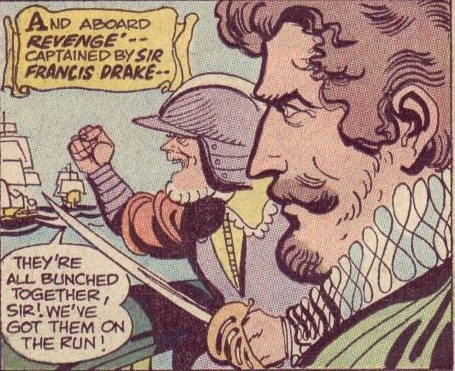 Later, when the island is wiped out, he appears again and is shot to death by someone aboard ship who disobeyed orders. These stories about the U.S.S. 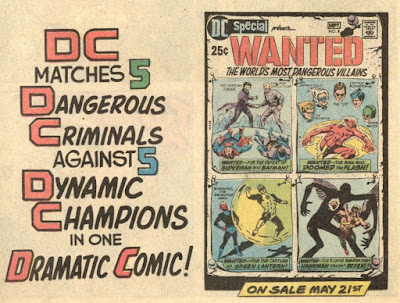 Stevens don't feel like anything else in the DC War Comics right now and, while they lack much plot or direction, they are usually interesting. Peter: Between the cracklin' Kubert script and the eye-poppin' Heath art, "On Time!" is just about the best Rock we've had this year. Only time will tell if new recruit "Turtle" will become one of the regular gang. Sam Glanzman delivers the best U.S.S. Stevens installment yet, a poignant tale devoid of any Rah-Rah for the war; instead, acknowledging the respect between warriors. A solid issue! and pick the best stories from 1953! 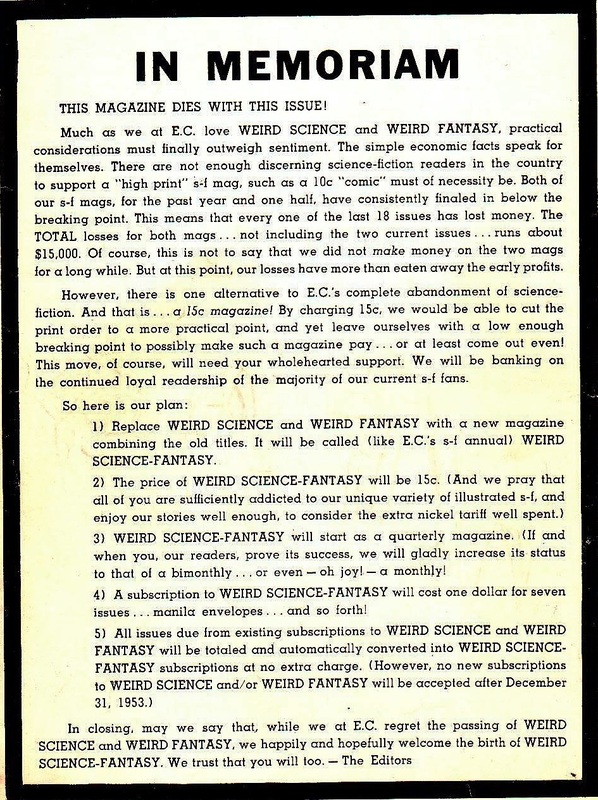 Peter Enfantino is an obsessive collector of Mystery, Crime and Horror digests including Alfred Hitchcock, Manhunt, Mike Shayne, as well as the entire stable of Warren Magazines. He has written for all the major channels on the topics, including Paperback Parade, Mystery Scene, The Digest Enthusiast, Paperback Fanatic, Men of Violence, Mystery File, Comic Effect, and Peter Normanton's From the Tomb. He Lives in Gilbert, AZ. John Scoleri is the author of several books on artist Ralph McQuarrie, the producer of a feature length interview DVD with actress Caroline Munro, and is the self-appointed curator of the I Am Legend Archive. Much of his free time is spent scheduling programming in his home theater, The Slaughtered Lamb Cinema. For more than ten years, John and Peter were co-editors of The Scream Factory: The Magazine of Horrors Past, Present and Future and bare•bones. They took the world by storm with their blogs, A Thriller A Day, We Are Controlling Transmission, To the Batpoles! and It Couldn't Happen Here. They're now expending their energies on the bare•bones e-zine. Jack Seabrook is the author of two books on popular fiction: Martians and Misplaced Clues: The Life and Work of Fredric Brown (1993) and Stealing Through Time: On the Writings of Jack Finney (2003). He has had articles published in crime fiction magazines such as The Armchair Detective and he is a lifelong reader of comic books! Among other things he intends to educate the world to the joys of Alfred Hitchcock Presents and (with Peter) DC War and Horror comics. Jose Cruz has written for a variety of sites and publications including Rue Morgue, Turn to Ash, Video Librarian, Classic-Horror.com, The Terror Trap, and Paracinema Magazine. His other ramblings can be found at The Haunted Omnibus. He lives in Southwest Florida with his wife and a very furry child. There's no stopping these guys! The Invaders — In Color! bare•bones e-zine © 2010-2016 Peter Enfantino, John Scoleri and Jack Seabrook. Awesome Inc. theme. Theme images by i-bob. Powered by Blogger.